Figure 1: Interaction of the pulse of duration τ with a smooth surface. 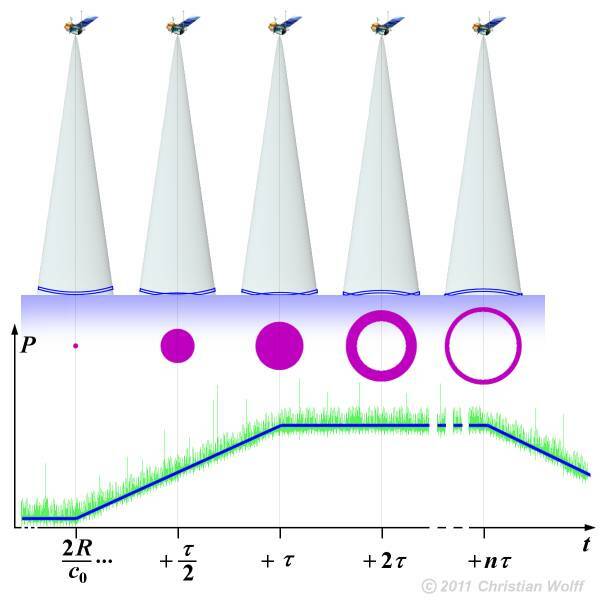 A satellite-based radar altimeter needs to measure the distance accurately, but only for an essentially planar surface, oriented orthogonally to the radar's line-of-sight. Hence, ocean-viewing altimeters have a small range window whose position tracks the delay and strength of the surface reflection. The altimeter measures the round trip time of the electromagnetic waves and their phase shift. As electromagnetic waves travel through the atmosphere, they can be decelerated by water vapour or by ionization. Once these phenomena are corrected for, the final range R is estimated within 2 cm. However, the transmitted pulse is subject to major changes during the reflection. This is caused by the curvature of the resolution cell by a few meters, so that the transmitted pulse cannot be reflected uniformly over a nominally level flat surface. After a running time of R/c0, the reflecting surface is arrived by the pulse at a point. The transmitted pulse reflects first from an area that may be much smaller than the footprint illuminated by the antenna pattern. During the compressed pulse length τ the area illuminated by the pulse rises to a circular area. After that a hole arises in the middle of the circular area: the reflection is finished in the middle, but on the edges of the antenna pattern (they have due to the angle a greater slant range) the transmitted pulse is not yet arrived at the Earth's surface. The illuminated area looks like a hoop. 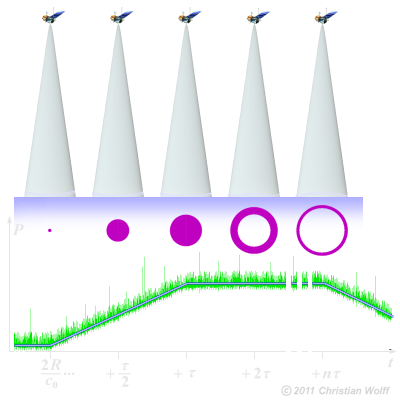 As long as the reflective surface increases, so does the received power – this is the leading edge of the received pulse (this happens up to the time (R/c0) + τ). If the hole arises, then the reflective surface is relatively constant – that is the pulse top. In the figure, the ratio between the compressed pulse length and the diameter of the hoop are not drawn to scale. For an altimeter in a 1000-km orbit a half-power beam width of 0.32 degrees would lead to a footprint of diameter 2.8 km. A compressed pulse length of about 3 nanoseconds leads to a reflected pulse with a length of more than 26 nanoseconds therefore. In practice the Earth's or the sea surface is rough rather than flat. The pulse edges are even more flattened further. For the measurement is therefore used exactly the point at which the rising edge of the echo signal enter the pulse top ((R/c0) + τ). As a result of random distribution of the ocean wave facets at any instant, each individual return signal is very noisy, but averaging of up to 1000 successive echo pulses can reduce this. The ocean's surface has a significant wave height of less than 20 m. Radar backscatter is primarily specular, spanning up to 20 dB. The altimeter is able to average out the effect of the ocean waves. This parameter is called a Significant Wave Height (SWH).